Fine hut-to-hut walking in this famously beautiful (if a times popular) area. Proper mountains, with craggy peaks and lovely forests. Enjoy some Japanese cultural experiences. The route runs along the crest of the mountains summiting various peaks along the way. Murodo is a popular hiking access point for walkers. Kamikochi is a one of Japan's 'National Cultural Assets' and is a very popular mountain resort. 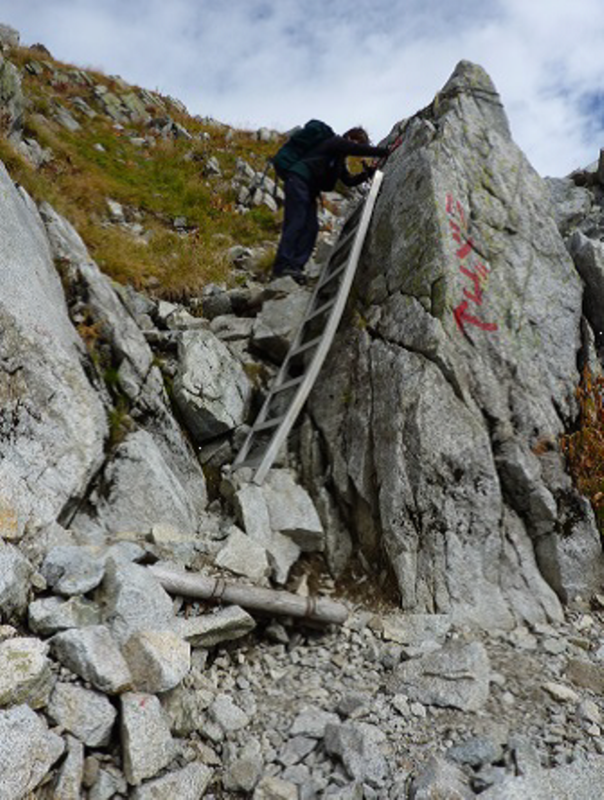 This is a demanding walk in high, remote mountains, where altitude can affect you. Come prepared. 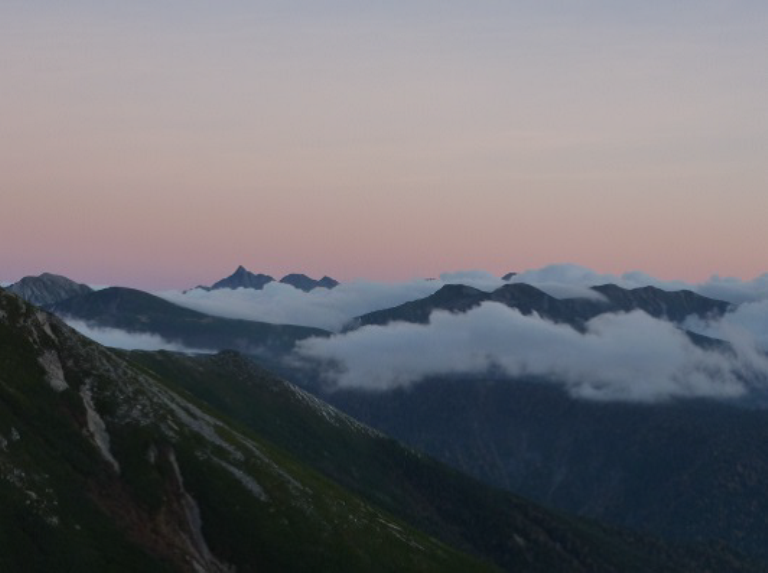 The Northern Alps run generally north to south and range from 1500 to 3000+ m in height. 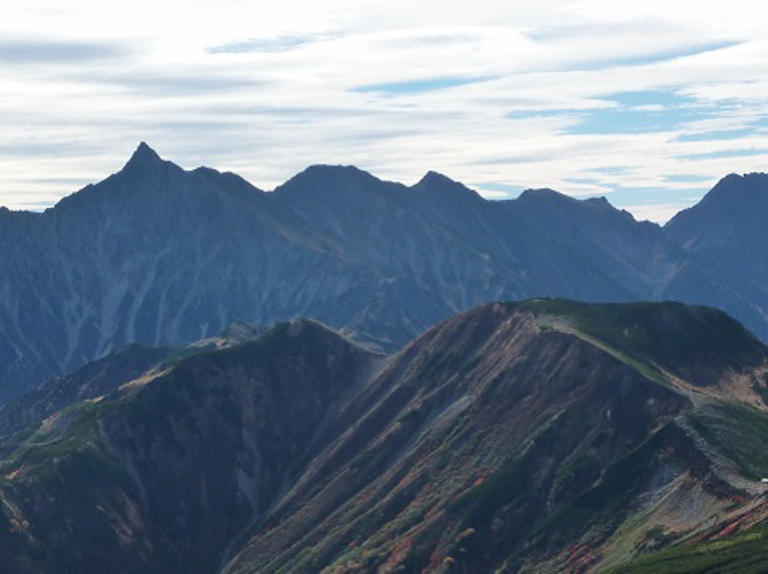 The Murodo - Kamikochi route runs along the crest of the mountains summiting over various peaks along the way. The start at Murodo is on a famous sightseeing route over the mountains and is a popular stop-over destination and hiking access point for visitors and walkers, with hostels and camping facilities. Kamikochi is a one of Japan's 'National Cultural Assets' and is a very popular mountain resort. 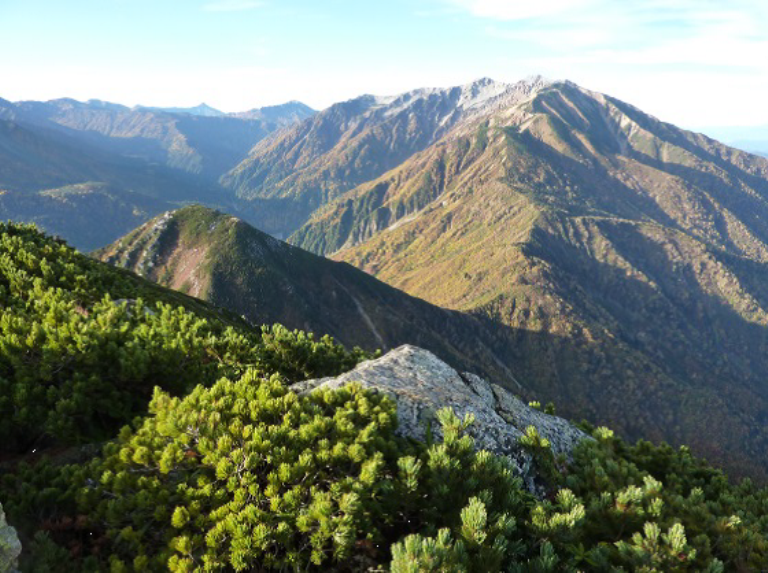 The mountains are VERY popular with the Japanese and can be busy in the main season particularly around Murodo and Kamikochi. The routes are all well walked, running along the ridgelines and often boardwalked in heavy traffic areas so way finding is not a problem. 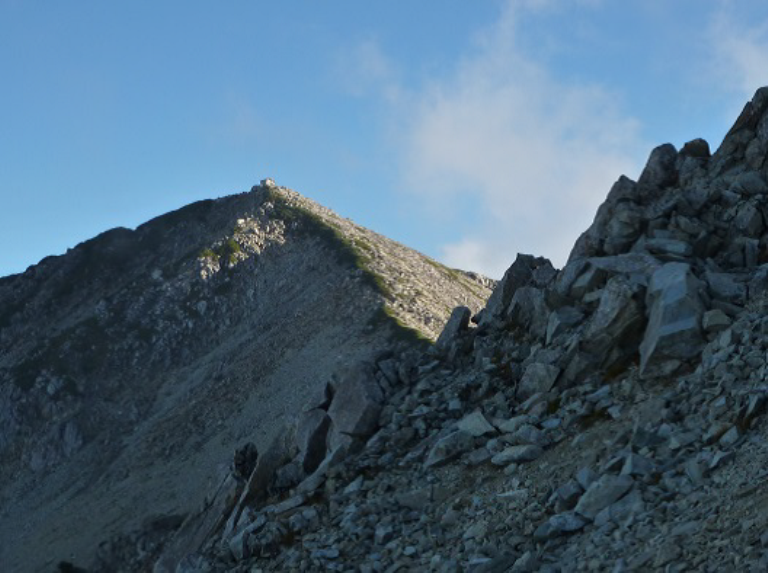 The terrain is rough so the paths often pick their way through boulder fields and steep slopes but there is no exposure, except on the famous Daikirreto near Kamikochi. Accommodation in the mountains is either at huts or camping at designated sites. The huts are large, with capacity for hundreds, are privately and individually run and since they overwhelmingly cater to a Japanese market can be awkward to make contact with. Hut accommodation is in various sized dormitories, often male or female with basic futon bedding provided, they serve meals if booked before fairly rigid deadlines, and are largely dependent on rainwater so toilet and washing facilities can be limited and smelly, with buckets and dippers for washing. The huts are not cheap, particularly if meals are included, ranging in price around Y 8500-9000 per person all-in, but they are comfortable, sociable, a source of food and drink and a refuge from the weather. Campsites are mainly associated with a hut and cost around Y 500 per person for a night. You can generally eat and use the facilities at the nearby hut. Late September / October is when the huts start to close for the winter and we had difficulty getting definite information about the status of the huts on the route. We didn't prebook any huts but started walking as early in October as practicable to maximise the chances of their being open. Campsites are always available but there is an issue of water supply and pack loads. Because we weren't sure if we would find all the huts open we decided to take camping gear and carry some food so we would be independent if we needed to be. This worked well as one overnight hut was closed and the packs were not too heavy. At busier times this option would let you avoid crowded huts. Huts also provide bento box lunch packs which are very tasty and save on carrying in all your lunch food. The mountains have a fairly Scottish maritime hill climate with hotter summers. 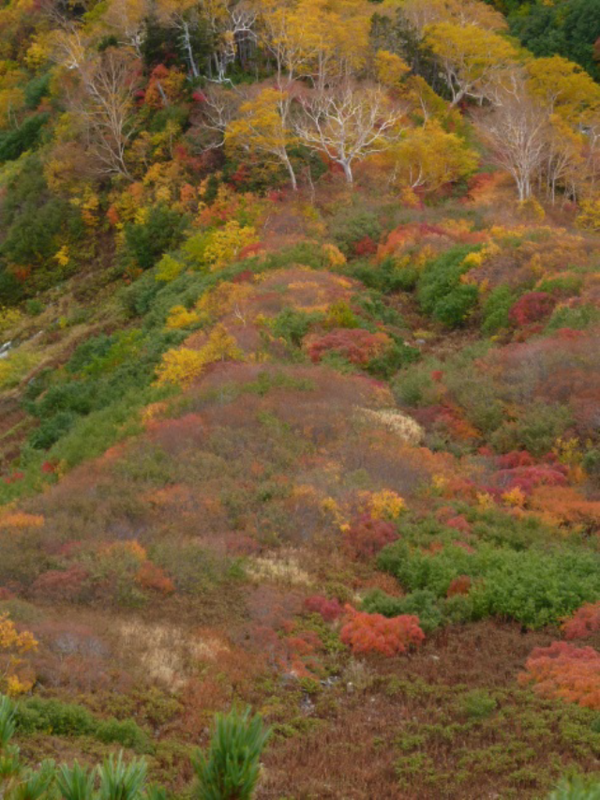 July to September is the main typhoon season and these are obviously a big danger in the mountains, otherwise autumn is known for its colours which were really coming into their own when we walked in October. We were very lucky with the weather, until a late season typhoon arrived. Finding Information is a bit hit and miss depending on whether websites etc. are only in Japanese. Lonely Planet do a hiking guide (latest edition 2009) which has good background, advice and information. 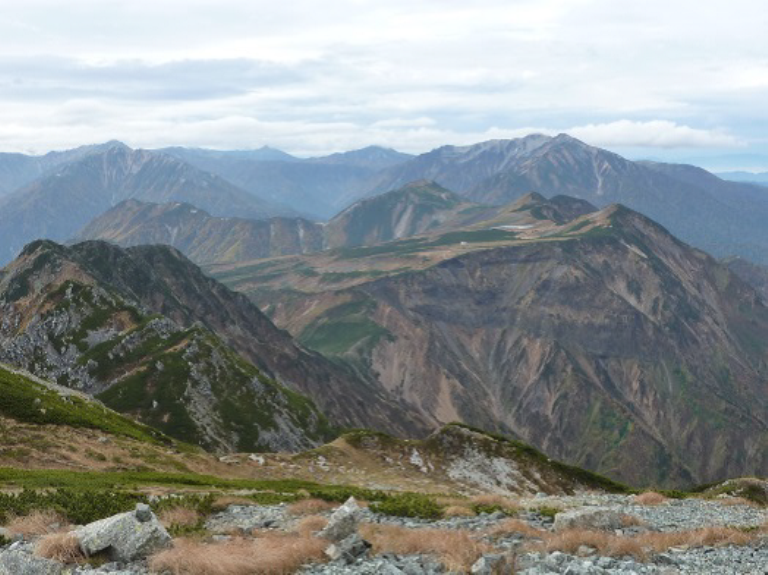 There are two good walking maps of the Northern Alps which are difficult to get hold of outside Japan and not on every bookstore shelf in Japan either. Their topographic maps are too hopelessly contour cluttered to be any use on the hill. We found that the hiking times in Lonely Planet were up to 20% faster than we could manage with camping packs. We found independent travel to be very doable with good train or bus connections to anywhere we wanted to go, understandable and available timetabling either on the web or onsite and friendly, helpful staff. We did a lot of research beforehand and took a lot of travel related printouts with us. Payment in Japan relies a lot more on money than cards, the huts only take cash, but carrying currency in Japan is the way of life and not a risk. 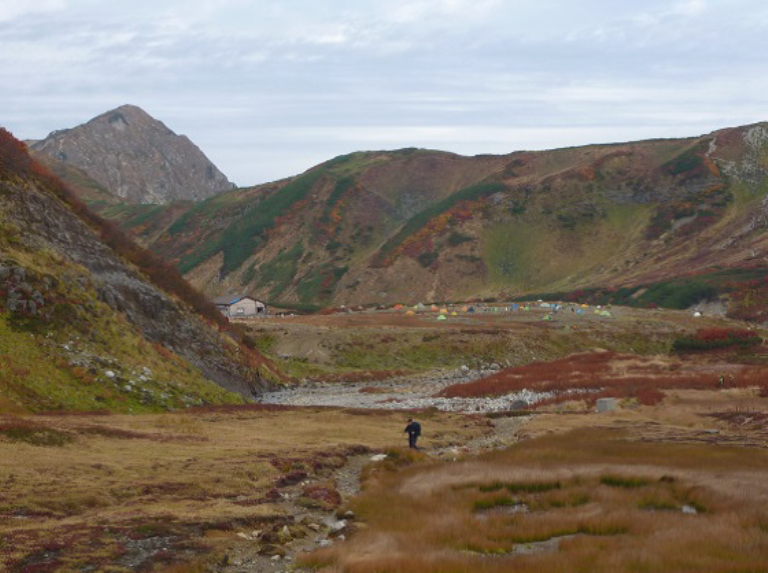 If we had managed to carry on from Sugoroku the next day would have taken us to Yari-ga-take, an iconic and busy Japanese mountain, where there are several large huts and campsites. After that there are two ways down into Kamikochi, one more exposed than the other. Kamikochi is a popular mountain resort with a lot of varied accommodation options and a slightly more complicated bus connection back to Toyama. WALKOPEDIA SAYS THANK YOU NICK! 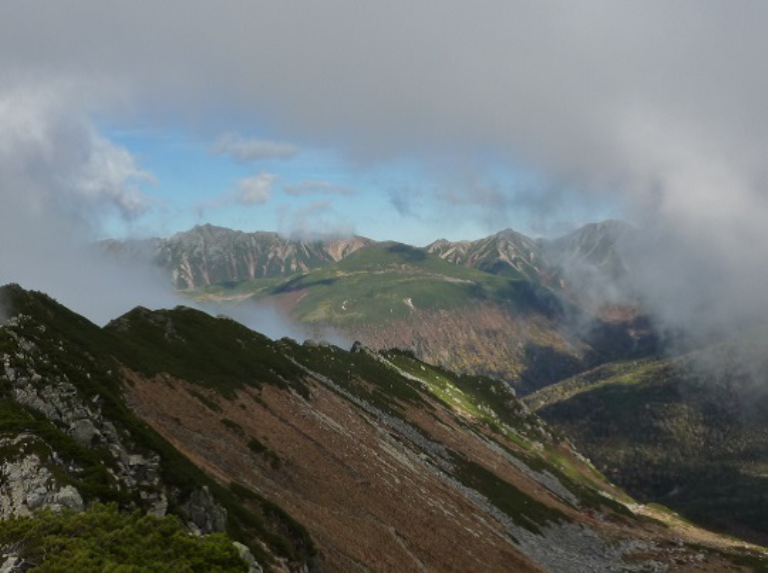 We were booked into a hotel in Toyama as part of the wedding arrangements and travel from Toyama to Murodo is by the TateyamaKurobe Alpine Route another famous and popular Japanese mountain experience. This is booked at the dedicated station in Toyama and involves a coordinated succession of rail, funicular and bus trips. It travels East-West and can be started from either side of the mountains. Murodo is a bit of a honeypot and the starting point for a lot of hikers but wasn’t busy when we were there. The campsite at Murodo is a short walk from the bus terminus and was fairly quiet. Day2 was a 7hr hike to the Goshiki-Ga-Hara hut. 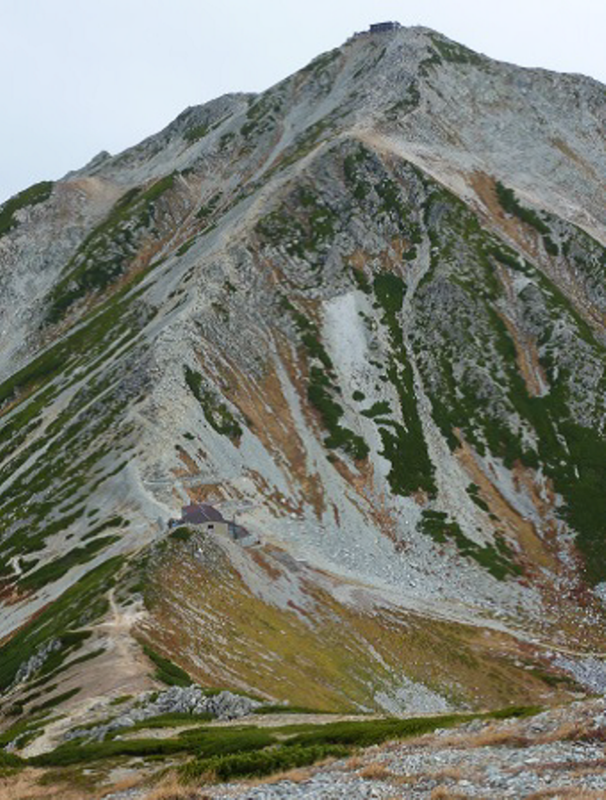 It started with a graded motorway up to a hut called Ichi-Ni-Koshi on a bealach under Tateyama, which can be hiked from that point. We headed south to a summit which seems to mark the limit for daywalkers from Murodo and carried on along a less well used path which followed the high ground to the hut. 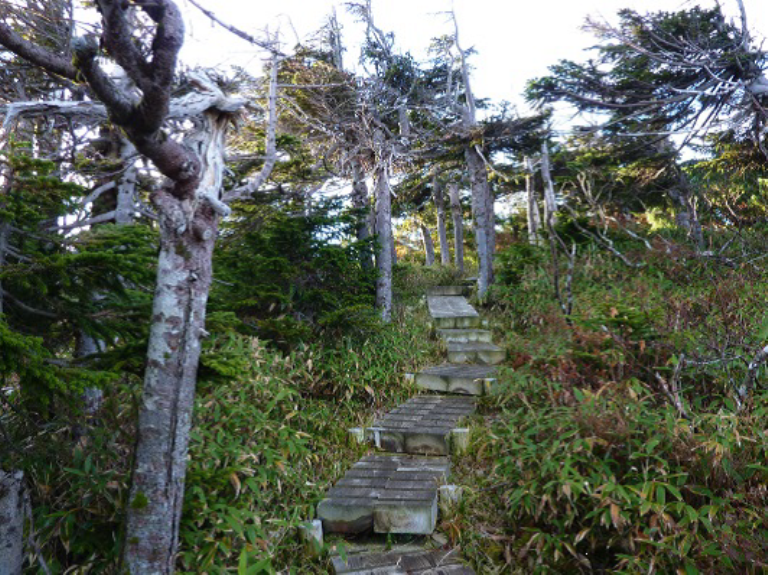 The path was fine with the occasional rocky outcrops. The hut had an associated campsite but as we knew the next day was going to be a long one we decided it would be simpler getting away in the morning from the hut, so we checked in to discover it was actually their last night of the season. We had a good evening meal, a room to ourselves in a packed up hut and a 5am start next morning. 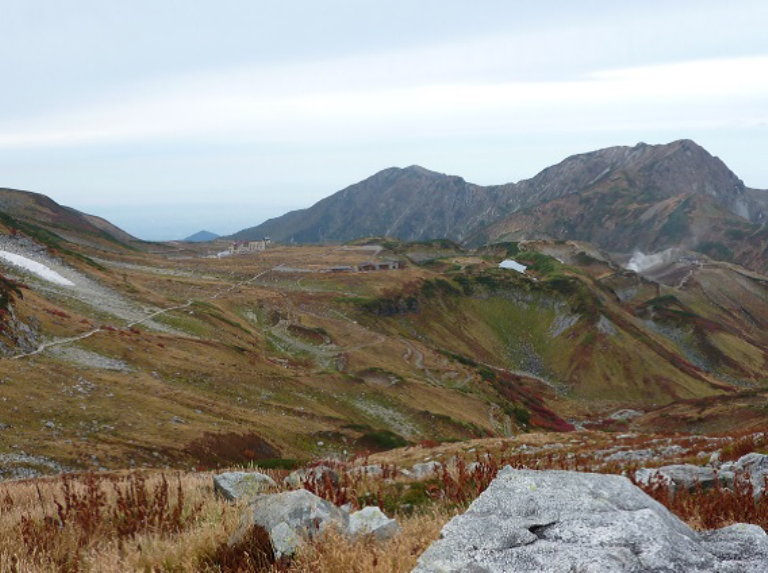 Day3 was a 13hr hike up and down to Yakushi-Dake hut over Yakushi-Dake mountain (2926m).